R.B. 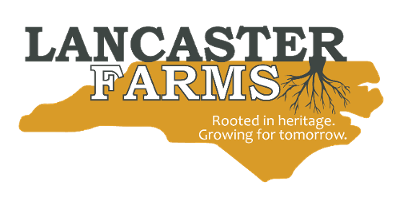 Lancaster and Sons Inc. is named for the oldest living member and the fifth generation of the Lancaster family living and farming in Wilson County, North Carolina. The family has lived and farmed here for seven generations; since the late 1700s. From their beginning as farmers well over 200 years ago, the Lancaster family has learned the value of producing quality food and fiber for their families, their neighbors, and now for the entire world. Generations of a family exist and thrive in one location only if they develop respect for their work and for each other, and they understand that quality in their fields and their lives produces quality in their products. Brothers Richard, Glenn, and Ronald Lancaster now represent the sixth generation of their family line engaged in the Lancaster enterprise. The four Lancaster cousins - Sarah Carraway along with Vann, Derek and Bryant Lancaster - represent the seventh generation, each assuming responsibility and leadership within different divisions of Lancaster Farms. While earlier generations of the family oversaw the production of tobacco, cotton, and grains on family farms, the present generations have increased their farming operation to nearly nine thousand acres of land, and added production of peanuts, sweet potatoes and other produce.